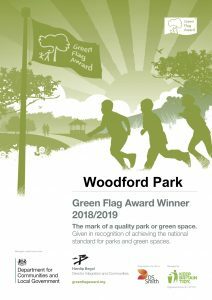 Woodford Park is the first park in the Wokingham Borough area to receive Green Flag status, and joins other green spaces awarded recognition across the UK. The park is among a record-breaking 1,883 UK parks and green spaces that have received a prestigious Green Flag Award – the mark of a quality park or green space. The judges were particularly delighted with the changes made from last year’s visit to Woodford Park and commented that “it was a privilege to judge this site on their second year of judging”. Key areas highlighted include the entrance to the park with the decorative gates, memorial and decorative beds being welcoming and inviting, as well as the new signs in the park. Healthy, safe and security was also commended, alongside how well-maintained and clean the park is, with very high standards for litter and dog waste. Woodford Park was also applauded for how the environment is managed with minimal chemical use and also the investment in the park’s biodiversity landscape; particularly the regeneration of the lake and the further work planned. “This site really delivers a great amount for the community as a resource. It is really well used by a wide range of community groups, some of whom organise regular events that provide a focus for community spirit in Woodley and enhance the area as a place to live and play. Really impressed with the Friends group and other community groups who are positive, enthusiastic and make a real contribution to the standard of the park. The paddling pool is an excellent facility for small children. The youth centre and skate ramps cater for young people. Provision for active sports is good. There are lots of benches for the elderly,” the report cited. 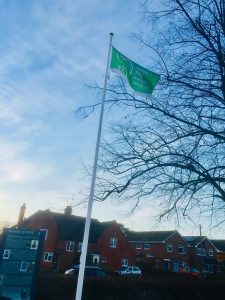 Woodley Town Council is now proudly displaying the flag in the park, along with the Town Council flag.